The Rodney L White Center is pleased to announce that Nobel Laureate Thomas J. Sargent was the first Rodney L. White Visiting Scholar. Professor Sargent’s visit took place in April 2014. Thomas J. Sargent is the W.R. Berkley Professor, a joint appointment in the Economics Department and the Stern School of Business at New York University. He has also held academic appointments at the University of Minnesota, the University of Chicago, and Stanford University. Professor Sargent was awarded the 2011 Nobel Prize in Economics for his empirical research on cause and effect in the macroeconomy. He was elected a fellow of the National Academy of Sciences and a fellow of the American Academy of Arts and Sciences, both in 1983. Professor Sargent is past president of the Econometric Society, the American Economic Association and the Society for Economic Dynamics. 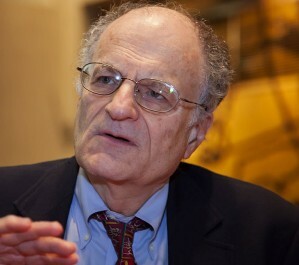 He has been a senior fellow at the Hoover Institution since 1987. Professor Sargent is the author of more than 175 papers. Among his books are Rational Expectations and Econometric Practice, with Robert E. Lucas Jr., University of Minnesota Press, 1981; The Big Problem of Small Change, with Francois Velde, Princeton University Press, 2002; Recursive Macroeconomic Theory, with Lars Ljungqvist, MIT Press, 2004; and Robustness, with Lars Peter Hansen, Princeton University Press, 2008. Professor Sargent earned his Ph.D. from Harvard University in 1968 and B.A. from the University of California, Berkeley where he was a university medalist as Most Distinguished Scholar in the Class of 1964.